Sometimes shareholders just cannot trust other shareholders to stand with them. 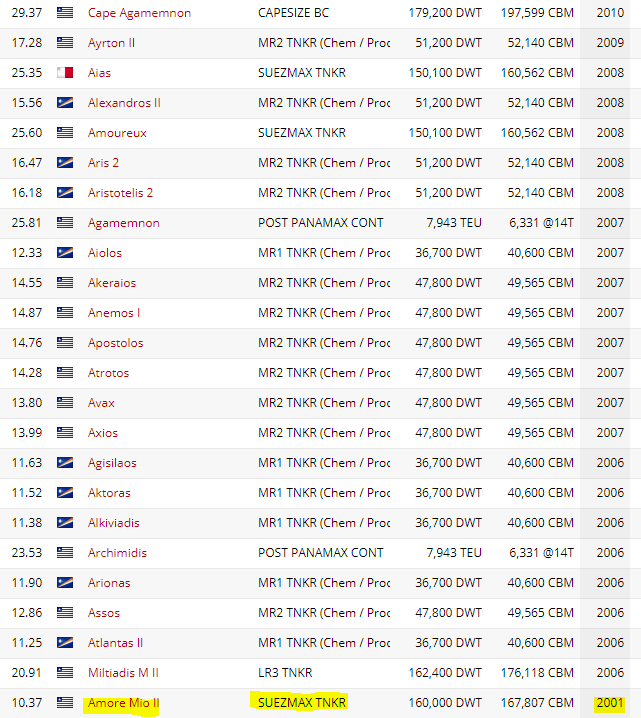 General partner ArcLight has a fair number of limited partnership shares of American Midstream (AMID). After some bad luck and a misstep or two, the limited partner unit now trades for about a third of the highest price just a couple of years back. One would have thought that ArcLight would work to restore the luster of this once thriving partnership. But instead, ArcLight knows a great deal when it sees one. The end of the third quarter is “window dressing time” for institutional funds. Therefore, to the detriment of long-term unit holders, ArcLight would like to take the partnership private at the “bottom of the market”. In fact ArcLight even waited for the window dressing period to depress the unit price as much as possible when making its latest offer to buy the partnership. The offer from ArcLight was for a whopping $6.10 per limited partner unit. The shares of course rallied above that price. But ArcLight knows Mr. Market pretty well. Long-term holders would probably get disgusted enough to sell their shares to traders who would be happy for a small short-term profit. ArcLight can increase the offer another 10% to 15% down the road to assure market acceptance at a premium to what the units are trading. However, ArcLight typically does not go for small profits. The firm usually aims to make far more money than 15%. The actions of ArcLight actually give credence to the value arguments that American Midstream is probably worth about $10 to $12 per limited partner unit. ArcLight is probably betting that the market will not bid the unit price to anything close to full value. Then ArcLight can take American Midstream private and realize the value of the assets in other ways. This ArcLight strategy takes advantage of the very poor market attitude towards this limited partnership. Normally, after a period of poor earnings and an over-extended capital structure, Mr. Market wants a growth track record before restoring a partnership to its full value. ArcLight appears to be impatient with Mr. Market. So the general partner has devised a way to speed up the return to full valuation. A few years back an investor could hardly imagine this situation. American Midstream was growing and the unit prices were heading towards the high teens. Periodic distribution increases were the order of the day. Then came the merger with JP Energy Partners. The ballyhooed effects of that merger were definitely not apparent after one year. The unit price lagged severely as it often drifted towards $10. ArcLight sold some under-performing divisions and then replaced those divisions with other divisions. But then a pipeline ruptured at the bottom of the sea and forced the general partner to contribute to the partnership while Delta House awaited the return of contracted volumes. Some commentators saw no progress between contributions from the general partner the year before for a warm winter. Then came the disastrous offer for Southcross Energy Partners (SXE). That was it. Mr. Market had had enough of missed guidance and unfulfilled promises. A distribution cut to deleverage the balance sheet was the final nail in the coffin. The partnership units were left for dead. But this is one general partner that is not about to leave a discount on the table. It matters not that ArcLight helped the partnership earn that discount to asset values. If the market would not value the partnership properly in the eyes of the general partner, then the general partner would buy the partnership. Later the partnership could be sold in pieces or repackaged and sold to the public at a later date. Profit is profit. ArcLight is not an organization that leaves spare change hanging around. The Southcross merger termination came with an announcement that Moody’s upgraded the liquidity rating of the partnership. That was followed by the second-quarter report where management announced a lower leverage ratio and further progress towards forecast goals for the year. Still the progress made did not impress Mr. Market at all. After all, the distribution had been cut significantly. Therefore nothing else mattered but that distribution cut. Obviously long-time shareholders would like to see the general partner make good on those long-term (great return) promises. Obviously, ArcLight never told the other shareholders that the bright future the general partner had in mind did not include the limited partner unit holders. Evidently the limited partners could bear the risk of failure without the rewards of success. Hopefully the limited partners now realize that ArcLight managed the partnership for aggressive growth. Income, even speculative income was never the main goal. The generous distributions were a side benefit of a very aggressive growth strategy. More importantly, if the market punishes the partnership “too much,” then ArcLight as the general partner will take the partnership private to realize a second profit by obtaining full value for the partnership assets. Maybe ethical behavior would dictate a public auction and sale of the limited partnership assets (or some sort of recapitalization followed by a return to growth). Clearly ArcLight went for the maximum profit plan and set the ethics part aside. This is something that potential long-term holders should keep in mind for any future ArcLight-led ventures that are potential investments. Clearly, ArcLight looked out for the interests of ArcLight first without worrying about the future consequences caused by unit holders taking a loss in their American Midstream investment. Investors can vote no on the coming shareholder vote for the ArcLight offer. Probably the best that will happen is a 10% to 15% increase in the offering price. The conflicts committee clearly has proven to be a rubber stamp body that is worse than useless to the small shareholder. Lawyers may not be much help in this situation either. Probably the best thing to do is sell the investment and move on. Promise yourself that you will not support any ArcLight ventures in the future regardless of the profit potential. If enough investors shun ArcLight’s products, then maybe it would behave differently in the future. But definitely do not count on an overnight transformation in favor of the small investor. I analyze oil and gas companies like American Midstream and related companies in my service, Oil & Gas Value Research, where I look for undervalued names in the oil and gas space. I break down everything you need to know about these companies – the balance sheet, competitive position and development prospects. This article is an example of what I do. But for Oil & Gas Value Research members, they get it first and they get analysis on some companies that is not published on the free site. Interested? Sign up here for a free two-week trial. Disclosure: I am/we are long AMID. Industries are not equal in terms of generating royalties for product ideas. “Where is the big money in licensing being made?” is a question I get asked all the time. I get it. You could end up spending quite a bit of time developing a new product for the market and licensing it, only to be disappointed by the size of your royalty checks. The solution is simple. Before you spend too much time on any one of your ideas, do the math. You can get a sense of your potential passive income pretty easily. Make a list of potential licensees. Select one. How many stores carry their products? If stores sell less than one unit a week, your product will get kicked to the curb. Then estimate the wholesale price of your product, which your royalty will come off of. Calculate what you would earn if your royalty was three percent. What about five percent? Seven? If the company is selling in 10,000 stores, the wholesale price of your product is 10 dollars, and your royalty is five percent, you would earn 50 cents for every unit sold, resulting in $5,000 a week. That’s $260,000 a year selling half a million units. Not bad. Here’s a breakdown of some popular industries to invent for and where the big money is. I started out licensing my ideas for novelty gifts. Most novelty gifts are seasonal. As a result, the ideas I licensed for Valentine’s Day, Easter, Christmas, and graduations produced low royalty streams. Companies needed to fill their distribution channels with new products, but they only sold for about 60 days. I earned about $10,000 for ideas like these. That worked for me, because basically all I had done was show a very simple sketch. I’d spent very little time or money. If you like to come up with silly and whimsical product ideas, focus your energy on events that are celebrated daily, like birthdays and anniversaries. I began coming up with my own novelty gift ideas because the inventor of the pet rock was from my hometown Los Gatos. I could not believe how well his product did! This industry is always looking for new ideas. A rough sketch is basically all you need. Sometimes even a short paragraph is enough. The same downsides apply to summer toys. The selling window is short! Your licensee might have wide distribution, but still. On the other hand, there are hit number one hit toys like Bunch o Balloons — licensed to ZURU — that produce a ton of revenue. In my opinion, it’s not easy to make big money licensing summer toy ideas. The competition is stiff. Who doesn’t want to relive their childhood and play with toys? It is extremely difficult to succeed at making big money toy licensing. So many people are chasing a number one hit toy. I experienced the mania firsthand when I worked at the startup that brought Teddy Ruxpin and Laser Tag to market. If you succeed at producing a hit toy, your royalties will be monumental. I got lucky once. My toy idea could not have been simpler. I loved basketball and so I shot hoops in my office with an indoor Nerf set. The backboard was boring; it had just a small image of Michael Jordan. Why not shape the backboard itself into image of Michael Jordan? Three days after I contacted Ohio Art, they sent me a contract. I was extremely fortunate to earn royalties for 10 years. The Michael Jordan Wall-Ball was in every major retailer; there were even commercials on Saturday morning. If my memory serves me correctly, I made about $100,000 that first year. Not bad for a $10 prototype. If you produce a number one hit toy or a toy that sells for many years (an evergreen) the royalties can be extremely large. For example, the inventor of the card game Phase 10 — Ken Johnson — has been earning royalties for decades. That’s the power of a trademark. The toy industry is full of highly creative people. These companies have been working with outside product developers forever and see thousands of ideas every year. So, it’s tough. If you want to become successful, stick with it. Make relationships. Familiarize yourself with its history. That’s the key to inventing for the future. This industry is on fire! It has been for quite a few years now. Licensing agreements are common. Some are looking for the next gadget, which will have a lifespan of three to four years at best. Others, like OXO and Joseph Joseph, are committed to making small improvements to existing products. These have a lifespan closer to 10 years. That’s what I would stick to if I were inventing for this industry today. No gadgets, just popular products made better. The pet and hardware industries are thriving and have also embraced open innovation. These are some of the easiest industries for licensing, because they’re looking for new ideas. Prototypes are helpful and you will need a well-written provisional patent application to secure a deal. Everyone is familiar with “As Seen On TV” products. Today these products are sold everywhere, including social media. This industry moves fast and is capable of selling large volumes. Some of the top companies offer very large minimum guarantees, meaning there’s a good chance your royalties are going to be correspondingly large. If you have a hit, wow! This is a difficult industry to succeed in. There are only five major players, and they only need one or two big hits a year. They review thousands of ideas, test some, and move forward with just a few. Your likelihood of success is small. You will need a prototype. Most of these companies do not care about intellectual property. These are products people use every day. Usually only once before they’re thrown away. This is where the big money is. In my experience, this is also one of the most difficult industries to invent for. Yes, the volumes are enormous. But think of the speed at which products like these are manufactured. If your innovation depends on new equipment, that requires a huge investment of capital. (More than one facility will be impacted no doubt.) All of which adds up to risk for potential licensees. You will need a wall of intellectual property to secure your ownership over an idea like this. One example that comes to mind is the Zip It, a tool for cleaning drains invented by my friend Gene Luoma. It’s a thin inexpensive piece of plastic that you can find in every major hardware store. Tens of millions have been sold. You might use it more than once, and it’s not as if this product is used every day, but every home in America has drains that need unclogging at one point. Only one of my products sold hundreds of millions of units worldwide, and it was a rotating label called Spinformation. It appeared on many different types of products, including water, vitamins, spices, alcohol, etc. These products are used every day. My royalty was five percent and based on the label’s cost. Not a large royalty. But, due to volume, it added up very quickly. A small account that ran one line generated about $250,000 in royalties, and this was just one category. Because there were so many different categories of products that featured labels, the royalties were very large. That’s a double whammy. If you invent a product that offers a benefit across many different categories, sells worldwide, and involves consumables, the royalties can easily merit you millions. Spinformation barely scratched the surface of its potential. After all, billions of labels are consumed every day. Don’t be surprised. It all comes down to distribution. Google’s search engine dominance can seem invincible, but that doesn’t mean the search giant isn’t willing to pay billions to ensure it stays that way. Google will reportedly pay Apple $9 billion in 2018 and $12 billion in 2019 to remain as Safari’s default search engine, according to Business Insider. The report comes courtesy of Goldman Sachs analyst Rod Hall. It seems like a hefty price to pay, but with Safari being the default browser on iPhone, iPads, and Macs—and Google continuing to generate a great deal of revenue from its original search engine business—the Goldman Sachs report finds the payments to be a fraction of the money it ends up making. “We believe Apple is one of the biggest channels of traffic acquisition for Google,” the report said, according to Business Insider. Bernstein analyst Toni Sacconaghi additionally revealed in 2017 that Google previously paid Apple an estimated $3 billion. However, the only real number available is from 2014, due to court filings, which revealed Google paid Apple $1 billion for its search engine spot. Considering $9 and $12 billion are big jumps in four and five years, respectively, and that Google and Apple won’t actually disclose the figure, it’s unclear how accurate the Goldman Sachs estimate really is. OK, so maybe a $1 million isn’t as cool as it used to be. Thanks, inflation, David Fincher’s “The Social Network” and Russ Hanneman! Making the two-comma club is still a noble financial goal. And an attainable one, with a little luck and a whole lotta work. Or vice versa, depending on where you’re at in life and how much money is already sitting in your bank account. With that caveat in mind, here are 50 ways that, taken collectively (more or less), could make you a millionaire. 1. Save 40 to 50 percent of your paycheck. Because, let’s face it, these days, it’s pretty much impossible to nickel-and-dime your way to $1 million. There are plenty of investing apps out there that can get you started. Some apps, like Betterment and Wealthfront, are robo-advisers, while others serve as online investment brokers. Think Robinhood and Stash. And then there’s Acorns, which lets you invest your spare change. You can find a rundown of how these apps work here. 5. Mix in long-term investments. We’re talking IRAs and 401(k) plans. These funds are essential for a stable retirement. But the tax penalties associated with early withdrawals should dissuade you from tapping that money for non-emergencies. In other words, “you don’t feel the temptation of diving into those accounts just to go to Disney World,” White says. If your employer matches up to a certain amount, well, that’s the amount you should deposit into the fund each paycheck. Otherwise, you’re basically leaving free money on the table. 7. … and your annual IRA contributions. In 2017, for instance, your total contributions to all of your traditional and Roth individual retirement accounts can’t be over $5,500 ($6,500 if you’re 50 or older) or your taxable compensation for the year, assuming your compensation was under that limit. 8. Take part in an IPO. Terrifying, we know, but think about how much Facebook stock originally sold for ($38 per share) and how much it’s worth now ($214.67 as of writing this.) Of course, be sure to consult a financial adviser before making any major investments. Sounds like a no brainer, sure, but people (ahem, Gen-Zers and Millennials) are into being extra these days. Don’t fall for it, Gen-Zers and Millennials: $400 pants are not an investment. That’s the theory all those tiny house hunters you’re watching on HGTV subscribe to: Less is more … and great for your bank account. If you decide to downsize — or, maybe, when you decide to downsize — make some money from your still-salvageable stuff. There are plenty of sites and apps, like eBay and Poshmark, that’ll help you sell your gently used wares to the masses. 12. At the very least, trim the fat. But, even if your budget is already lean, there’s usually at least some place you can trim more fat. Common money-wasters? Avocado toast. Your morning coffee. $1,000 smartphones. You know, the usual. 13. Remember, you’re not cheap; you’re thrifty. Notice we didn’t say “pay your debt down.” That’s certainly important, but also it’s own thing. Like, if you’re seriously in debt, focus more on paying it down and less on making your million, you know? That’s a term used to describe someone who’s living in a home that’s essentially eating all of their income. So, yes, you might be paying your mortgage, but you’ve also got credit card debt and $0 in your emergency fund. If you can’t save three to six months’ worth of expenses, how are you going save $1 million? 16. … but do try to buy a home. 17. Keep rent well below 30 percent of your income. That’s the general rule of thumb when it comes to the cost of housing, but, if you’re trying to hit a mil, you’ll need to aim higher. Or lower, in this case. Think 20 to 25 percent. Lest a fire, break-in, explosion, etc. drain your coffers and blow your master plan. And, yes, that goes for renters, too. You can learn more about renters insurance here. Disability insurance will replace some or most of your income if you’re suddenly unable to work for a period of time. Car insurance covers you if you cause an accident with your vehicle. And, as your wealth grows, umbrella liability insurance can cover anything in between. Bottom line: If you’re trying to build your net worth, you have to protect your assets. 20. Keep your credit shiny. As anyone involved in the Equifax data breach undoubtedly knows by now, your credit affects everything: how much interest you pay on a loan, what apartments you can score, how high your car insurance premiums climb. The list goes on and on. To keep good credit, pay all your bills on time (yes, every single one), keep your debt low (told you) and add new lines of credit organically over time. It’s easy to get entrenched in a contract, but we’d be the first to tell you, it pays to shop around. Call up your current service providers — cable company, credit card issuer, etc. — to see if you can score a lower rate. If not (and your contract is set to expire), take your business elsewhere. 23. Doing life? Save less … just not too much less. Once you get to spouse and 2.5 kids-mode, it gets a lot harder to bank nearly half of your paycheck. Aim instead to invest 20 percent-plus of your monthly income into a retirement account. That way, “by the time you hit retirement, the compounding returns should easily make you worth much more than $1 million,” White says. 24. Save a minimum of 10 percent of your income. “No matter what happens,” he said. There are ways to make saving a little bit easier. One method involves setting it and forgetting it. “Every time you have a [paycheck] deposited, have your bank account setup to automatically put a certain amount in your savings account or investment portfolio,” Jay Labelle, owner of The Cover Guy, says. 26. Keep your emergency fund separate from your actual savings. That way “you don’t dive into your savings or investment accounts if something unexpected happens, which it will with kids,” White says. Couples with kids are (probably) less inclined to throw down a bunch of money on $85 pet rocks. But there are certainly temptations prospective $1 million parents will need to negotiate. “Find memorable, but affordable, vacations,” White says. “You can have a blast with your kids without spending $20K.” Here are some affordable family vacations to consider, if you’re in the market for a getaway. Sure, you want to buy a new TV or Escalade, but you’ll reach a $1 million much faster if save that money for later. 29. Early to bed, early to rise. Makes a person healthy, wealthy and wise, you know. 30. Get a side hustle. If you can’t save more, make more. And, thanks to the gig economy, there are plenty of ways to bring in a little extra income on your nights and weekends. Thanks to sites like Airbnb and VRBO (Vacation Rentals by Owner), it’s also possible to make some extra money when you away. You just gotta be cool with renting out your place to strangers. Who knows? Your side hustle could turn into a full-time gig. Or maybe you’ve got an innovative idea venture capitalists will love. That might sound real pie-in-the-sky, but consider this stat, courtesy of the Cato Institute: Roughly one-third of first-generation millionaires are entrepreneurs or managers of nonfinancial businesses. That could mean scooping up some investment/rental properties as your wealth grows. Or something as simple as renting out a room in your abode to help with your mortgage. We hear house hacks are all the rage these days. Dirty word, we know, but, per Forbes, top influencers can take home about $187,000 per Facebook post and $150,000 per Instagram. That’s according to Mark Cuban, and while it sounds … well, kind of terrible, we figured we’d pass it along. Not enjoying life is actually a theme among self-made millionaires. Earlier this year, VaynerMedia CEO Gary Vaynerchuk said Millennials were financial failures because they watch too much Netflix and play too much Madden. Studies have found wealthy people exercise more. Plus, you know, it’s good for your health. Wage stagnation has let up at least a little bit since the recession, so you might find there’s more money to be made in your current position. Case in point: Senior executives who changed jobs in 2013 received compensation increases that topped 16 percent, according to a survey from Salveson Stetson Group. Don’t take any bonus options you have at work for granted — and, by that, we mean don’t assume you won’t net the full amount. It might require a mad dash to December, but you definitely won’t get the money if you don’t put in the work. Not already eligible for a bonus? 40. Ask for a bonus. So long as you deliver on a certain goal, of course. If you want to make a million, you need to make sure your spending doesn’t increase alongside your income. Seriously. Lifestyle creep is a big problem that’s kept plenty of high earners from maximizing their money. 42. Think like a hacker. This one comes courtesy of Facebook CEO Mark Zuckerberg. 43. Go on a game show. I mean, the grand prize for Survivor and Who Wants to be a Millionaire is $1 million. Remember, once you’re over the age of 50, you can make annual “catch up” contributions into certain retirement accounts, including 401(k) plans and IRAs. You can learn more about what amounts you can allot to each account on the IRS’ website. 45. Hold off on taking Social Security. Also helpful for people who are older, but not quite at the $1 million mark, because, thanks to delayed retirement credits, your can receive larger (in fact, the largest) Social Security benefits by retiring at age 70. 46. Work all the tax breaks. Flexible Spending or Health Savings Accounts. Commuter benefits. Property tax and mortgage interest deductions (told you it helped to own a home). Make sure you’re capitalizing on anything and everything Uncle Sam offers in terms of tax breaks. The higher your income, the more complex your finances will be. (Case in points: all those tax breaks we just mentioned.) And, at a certain point, it’s a good idea to bring in the professional — a certified financial planner or certified public account — to help you manage your money. Because you can’t make amass a small fortune overnight. In fact, a 2016 study found it took the average self-made millionaire an average of 32 years to become rich. Because you can make $1 million. MADRID (Reuters) – Thousands of drivers for ride-hailing services Uber and Cabify, waving flags and chanting slogans such as “we want to work”, marched down Madrid’s central boulevard on Thursday ahead of plans by the government to tighten regulation. In Spain, there are almost 11,000 vehicles with ride-sharing licenses and more than 65,000 with taxi licenses, Public Works Ministry data shows, with more than 150,000 taxi drivers and 15,000 Uber and Cabify drivers operating throughout the country. “We don’t know what is going to happen next, our future is uncertain,” he said, while taking part in the march. Taxi drivers, who staged their own six-day strike at the beginning of August to protest against licenses for Uber and Cabify, say the services, which are hailed via smartphone apps rather than on the street, are deliberately under charging. “We cannot compete against corporations like Uber and Cabify, their prices are way too low,” Madrid taxi driver Jorge Gordillo, 33, said. Its struggles didn’t scare away investors, however: In August 2017, the startup raised $100 million, giving it a $1.8 billion valuation. That provided Armstrong with the capital and clout to hire talent that could help him right the ship. Coinbase poached longtime Twitter operations executive Tina Bhatnagar to help repair its customer service shambles, and it brought on HP veteran Asiff Hirji as COO. Armstrong has also committed to hiring inclusively: Coinbase, by company rule, interviews three qualified people from underrepresented backgrounds for each open position, and 33% of leadership roles are held by women. Coinbase has also doubled its headcount over the past year to nearly 1,000. The extra staffing has helped restore work/life balance and reduce the number of all-nighters. Arm- strong, for his part, is showing his staff that he too can chill out. This includes recapturing some of the vibe from the company’s early days. Back then, Armstrong and Coinbase’s third employee, Olaf Carlson-Wee (who today runs Polychain Capital, the largest U.S. crypto hedge-fund) would team up in epic Halo matches against business VP Fred Ehrsam, a former high school gaming champ. There was also a lot of ping-pong and rock-climbing. Today’s version of chilling out includes Armstrong indulging his penchant for belting Disney songs in the office and at off-site karaoke. One staffer (who calls Armstrong a “great singer”) described the CEO leading a recent Little Mermaid sing-along at a bar in San Francisco’s Castro District. A shift in sentiment is occurring in AMD (AMD). Look and listen and you will see and hear various news organizations/authors starting to beat the fear drum that AMD has gotten ahead of itself and is overvalued. Maybe that’s true or maybe it is not. However, it’s reminiscent of the scene in “Batman Begins” where Ras’ al Ghul says “breathe in your fear” because that’s what successful investors/traders have to do. You have to acknowledge problems at a company, a.k.a. fears, and learn how to trade around it. We could also say “breathe in your hype” as analysts, for the most part, are upgrading AMD to sky-high levels without due diligence. We also have daily “upgrading” to play catch up – with a few analysts posting lower price targets than the current share price – a.k.a. stealth downgrades. Thus, we are looking at an upcoming earnings cycle of extremes. Here’s our view and how we might play Q3 earnings for AMD given the fear and hype. The question is this – Is AMD overheated? Maybe… it feels like a mixed bag when one looks at CPU/server sales and then the bearish GPU outlook. Sure, the long-term story is great (and I’m long term very bullish). But in the short term… let’s review the concerns. Nvidia’s (NVDA) new GPU series reviews are in and it’s a mixed bag. On one hand, you have some interesting technology upgrades, i.e., hybrid ray tracing and new anti-aliasing methods for ultra high-end GPUs. On the other hand, you have very high prices (given the less-than-enthusiastic performance gains). If prices were lower, the masses would be a bit happier. Nevertheless, the real meat will be how Nvidia prices mid-range mass cards such as the 2050 and 2060. Those are the cards that will compete against the aging AMD Polaris GPU line (the 400-500 series). Crypto miners are currently flooding the second-hand GPU market. One friend of mine recently sold his entire crypto operation of 70x Nvidia 1080 Ti cards on eBay to replace it with ASIC processors. Multiply that times millions of miners. The market is being flooded with GPUs. Expect to see more rebates and price cuts on the GPU side of the house. Nvidia can (hopefully) swing users to the new 2000 series once the low-to-mid range cards arrive. At the moment, AMD has no new GPUs to push consumers to… though rumors point to a Polaris 3.0 refresh. Our good friend, Akram’s Razor, covers the GPU demand in his article “Winter Is Here.” He goes into detail covering the lack of demand seen by the Asian add-in board GPU companies. It’s well worth the read. Here’s a small taste of GPU goodness from his article (copied with permission from the author). 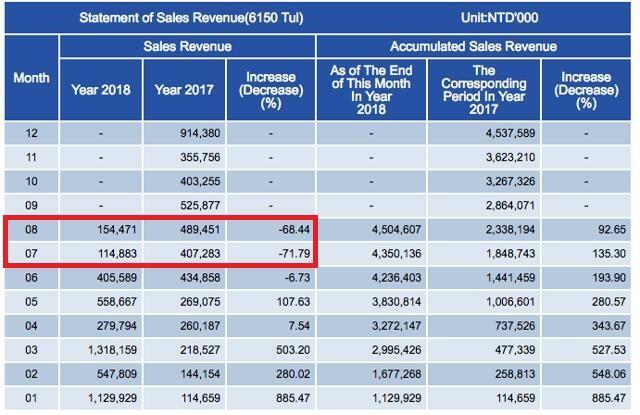 The early evidence of the pressure on this business can be seen in dedicated AMD AIB TUL Corp.’s monthly revenue data. Looking at the numbers he compiled, we can see a massive drop in GPU demand starting in July of -71.79%, followed by August at -68.44%. Speaking of weak sales – just last week, the cheapest we could buy an AMD 580 8GB card was around $225 after rebates. This week you can get a brand new AMD 580 8GB MSI for $189.99 after rebate AND it comes with $150 of free PC games. Did we mention it ships free? Let’s see the prices on Camelcamelcamel which tracks Amazon sales. Note, you can find prices higher or lower than the ones we are showing. We stuck with the 8GB AMD 580s as that is a good mid-range card consumers flocked to during the mining craze. Notice, the red used line is drifting down fast. The bright note countering the mixed GPU outlook is Intel’s (NASDAQ:INTC) CPU shortage. Obviously, AMD can sell into the demand Intel is experiencing. Recent Nvidia reviews detail that the 2080/2080 TI are CPU bound. This bodes well for both Intel and AMD. If consumers are willing to fork out premium dollar for these high-end cards, then they should be pairing them with the high-margin solutions from both companies. Obviously, AMD can benefit from Intel not being able to meet demand. The Nvidia RTX price-to-performance is wanting, but by Nvidia at least getting the cards out the door (and the tech to developers), it’s a positive event for Nvidia. The huge die sizes of Nvidia cards mean that if AMD can move Navi’s release date forward and get it out pre-summer – AMD could bring some heat to Nvidia’s line of products. Navi is rumored to be a smaller part with high performance. If Navi does, in fact, have a smaller die size and bring good price to performance numbers… AMD could have a hit on their hands. Then again, that’s a lot of “coulds” and “if” statements for a product that is not even out to compete and not scheduled to arrive for quite some time. Furthermore, Nvidia will not be resting idle… expect a 7nm shrink on Turing with time using the same process AMD is using at TSMC (TSM). Currently, updated rumors of a Polaris 3.0 refresh have surfaced, pointing toward a 10-15% speed bump. While not exactly exciting (Polaris architecture was introduced in 2016), the 500 series does offer good price-to-performance for the dollar. A refresh would help bulk up AMD’s GPU division and perhaps buy them much needed time (while giving gamers something new to covet). 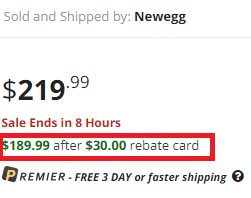 This would, in effect, redirect demand from “used” cards to AMD’s “new” cards. At this point, we are day and swing trading the January $29 and $30 puts. The daily follow-the-leader “upgrades” create nice entry points; the subsequent daily slumps in price in the evening offer nice exit points. As the old saying goes… “It works till it doesn’t.” As of now, it’s working but eventually, things change and we will adjust fire accordingly. We are keeping the positions rather small though as to avoid trouble if AMD blasts off to infinity and beyond. However, we are having a blast playing the ebb and flow of daily pops and drops. As we approach earnings, we will explore putting a straddle in place to catch extreme movements when/if it makes sense. Given the murky waters concerning earnings outlook (optimistic server and CPU expectations – very negative GPU outlook), we might see extreme movements that we are able to profit from. After Q3 earnings, we expect much-needed light to be shed on the stock. From this, we can adjust fire. Options can be dangerous: Tread with caution. Investors should not read this and mimic it, as the information will be out of date and stale. Investors or traders should view this simply as an idea and then adjust it to meet needs. If you need more help, please consult your broker. AMD at the current price and baked in expectations is obviously dangerous. Play safe. Have fun. Disclosure: I am/we are short AMD. Additional disclosure: We own $29 and $30 Jan 2019 puts. We may use a straddle as earnings approaches to capture extreme movement up or down. We wrote this using an Intel CPU and AMD GPU. Capital Product Partners LP (NASDAQ:CPLP) is a shipping holding company specializing in vessels with medium and long-term charter contracts, primarily in the product tanker and container sectors. CPLP has superior forward revenue visibility due to the nature of its contracts and staggered roll-offs. This allows it to appeal to more income-focused investors versus direct rate speculators. Despite this strength and a very strong balance sheet, the stock has been trading terribly towards the end of summer 2018. This report will examine current asset values, cash flow potential and long-term sustainable payout levels. Current NAV is over $4/unit, even with underlying asset values near record lows. CPLP currently trades at $2.79 with approximately 130 million common units outstanding, for a current market capitalization of just over $360 million. It also has nearly 13 million convertible preferred units (privately held), with a par value and conversion at $9/unit. CPLP common units currently offer a quarterly distribution of $0.08 for a current yield of 11.5%. CPLP has a fleet of 37 vessels, primarily made up of product tankers and containerships on medium- and long-term charters. 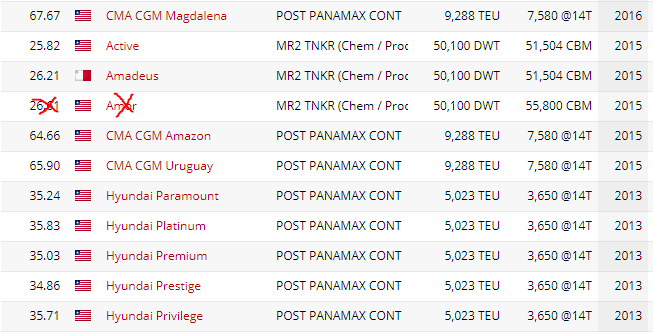 The majority of these vessels are on fixed charters to top-tier counter-parties, with current employment shown below. The primary exceptions are its 4 Suezmax crude tankers, of which 3 are on weak spot rates and 1 is on a weaker short-term charter. These weaker rates have been holding back cash flows, but spot rates have recently improved, and I expect significantly better performance by Q4-18. Although income vehicles are traditionally valued on yield, the underlying asset values are important to intrinsic value. Most high-yield companies have unsustainable payouts backed by weak assets. That’s not the case at CPLP. We can calculate CPLP’s “intrinsic worth” by figuring out net asset value (“NAV”), which is similar to tangible book value. For shipping firms, this is essentially fleet valuations minus net debt. According to VesselsValue, our preferred source of live valuations, the current fleet is worth $914 million. Additionally, CPLP has above-market charters (very lucrative charters on 8 containerships and 1 dry bulk vessel), which I value at $208 million using a 10% discount rate to EBITDA, adjusted for vessel depreciation. For the liabilities side of the house, as of Q2-18, CPLP reported net debt (6-K, page 2) of roughly $449 million. It also had $117 million in par value of preferred equity. Altogether, the company’s NAV is about $556 million ($1.12 billion in assets minus $566 million in liabilities). With 129.7 million units outstanding (127.25 million common and 2.44 million GP), current adj. 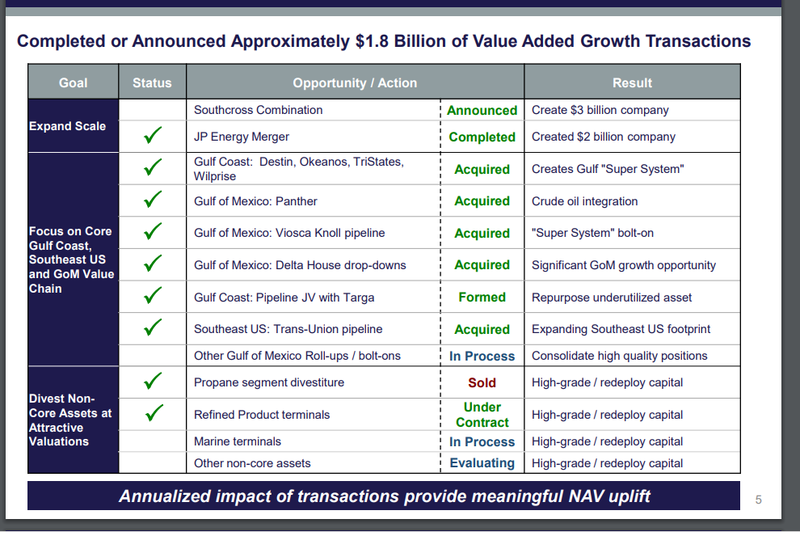 NAV at CPLP is about $4.30/unit, which means the current units trade at a huge 36% discount to intrinsic value. Unlike the vast majority of high-yield plays, CPLP’s yield is simply high due to a weak price, not because of weak assets or unsustainable payouts. CPLP’s current NAV is based on underlying asset values that are near all-time adjusted lows. Sentiment has been terrible after several rough market years, and ship prices reflect this. If product tanker markets recover substantially by 2020, I anticipate that as earnings increase, the company’s underlying fleet values could surge by $200-300 million and NAV could easily surpass $6/unit. In such a market environment, which I believe is very likely prior to 2020, CPLP’s payout could see significant increases. If an eventual refinancing is achieved, a doubling is possible. The IMO 2020 regulations, which limit the use of high-sulfur fuel to a maximum of 0.5%, go into effect in just over 15 months. This new regime will force shipowners to pursue regulation-compliant blends and is poised to add significant demand to the product tanker sector. This is CPLP’s primary exposure, and almost all of its containerships are also on long-term contracts (which means CPLP doesn’t pay for rising fuel costs), so unlike many other shipping companies, its net impact is clearly skewed positive. … IMO 2020 sulphur regulations are expected to have an impact from mid-2019. 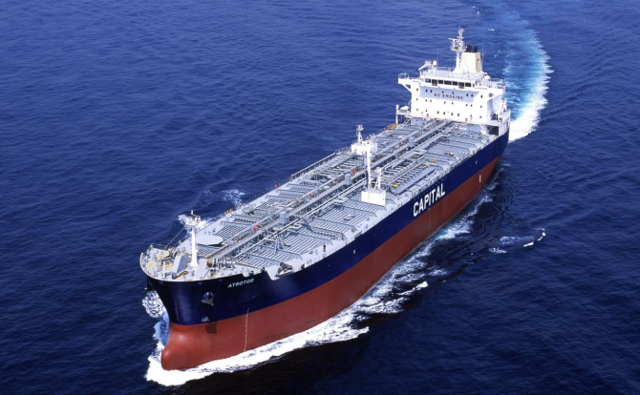 The initial estimates suggest that approximately 2 million barrels a day of refined products will display high sulphur fuel oil, with the majority of this moving at sea and over longer distances, with some analysts calling for a 10%-plus increase in product tanker demand. This surge will likely occur right as CPLP begins to roll over lots of its contracts. It is very possible we could see a surge in DCF, which further strengthens CPLP’s hand towards longer-term deals and potential refinancing. CPLP recently produced steady Q2-18 results, demonstrating strong cash flow even as all other product tanker peers have struggled due to weak spot markets. The company was able to secure strong employment for eight of its product tanker vessels by offering 2-3 year contracts to Petrobras (NYSE:PBR). The primary reason CPLP’s coverage was weaker is due to the very weak Suezmax tanker markets (as noted earlier), where the company has had 4 vessels roll off from $21-26k/day charters into a spot market with Q2 performance around $10k. Three of these vessels are currently operating in the spot markets and 1 vessel is employed with an $18k/day contract. This impact alone is set to drop cash flow by nearly $4 million a quarter, around 3-4 cents per share. This was slightly offset by a new Aframax dropdown and improved containership rolls, but challenging product tanker markets have left CPLP’s core fleet mostly treading water. The good news is that Suezmax spot rates have stabilized and are set to increase into Q4. Interest expenses are set to decrease q/q going forward from Q2; however, the y/y comps are difficult because the credit facility is tied to LIBOR, specifically L+325 basis points (3.25%). As the chart below shows, LIBOR shot up in early 2018, but has now stabilized. Assuming $450 million of long-term debt, the increase in LIBOR by roughly 100 basis points (1%) since last year adds nearly $5 million in annual costs, or about 1 cent per quarter. The combination of these two negative impacts have been the primary reason why CPLP’s coverage has been reduced. Operating performance has generally been quite strong, but these are difficult markets. 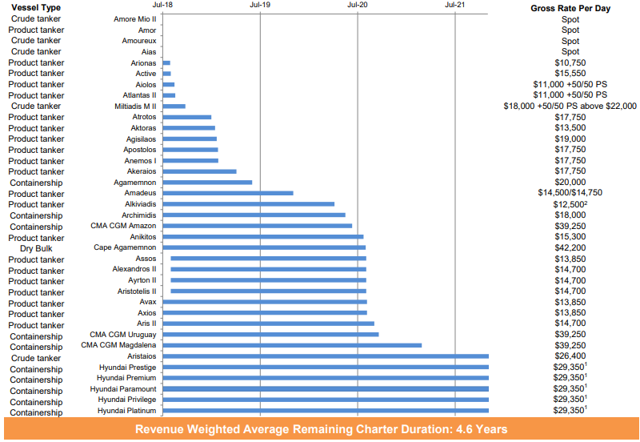 Product tanker markets are difficult, but medium and long-term charter rates have been mostly stable for the past two years. 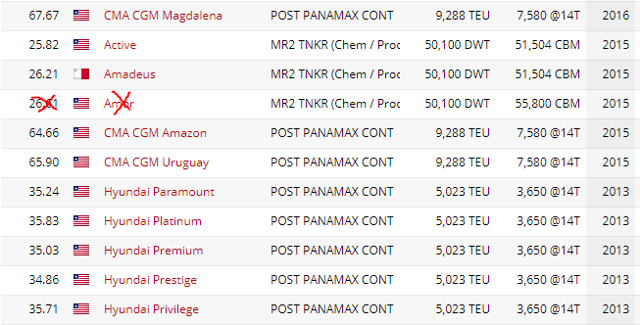 CPLP has a few challenging forward rolls, such as the 5 product tankers shown below, but with my current market estimate at around $15k/day, we’re looking at roughly a 1 cent impact per quarter, easily offset by just the recent improvements in Suezmax conditions alone. With all of the facts described above, I expect overall reported coverage for both 2018 on average, and most of 2019, to be very close to 1x. The 4 Suezmax crude tankers offer a chance for higher coverage if CPLP can improve those charters. There will also be a natural improvement in reported coverage, as debt loads are reduced and LIBOR rates seem to have plateaued for now. The rest of the report will discuss how the company’s current reported coverage is incredibly conservative and long-term sustainable levels are actually much higher. The full amortization split is also disclosed in its most recent quarterly filings, which shows the impact of these payments. Setting those 3 minor facilities aside, we are left with $419 million of debt ($406 million after the July 2018 payment), attached to 34 vessels worth $822 million, and around $200 million worth of above-market charters. Total leverage is a fairly paltry 40%, or a moderate 49% even if charters are excluded. This facility is split into two parts: Tranche A, covered by 10 modern vessels, and Tranche B, covered by 24 middle-aged vessels. Tranche A currently carries an estimated $231 million balance and will be repaid through 2023 ($187 million due in 2023). As shown below, the current fleet values for this basket of assets is about $427 million, and leverage is 54%. Tranche B has an estimated balance of $176 million and will be 100% repaid by Q4-2023 (repaid in 24 equal quarterly installments of $8.4 million). As shown below, the combined fleet valuations are about $395 million. Based on the rigorous amortization schedule, demolition values alone will surpass the corresponding debt by mid-2019, but only one vessel (“Amore Mio”) is even remotely a demolition candidate until at least 2026. This is an unprecedentedly conservative financing facility. I walked through each of the financing facilities to give a clear fleet picture for CPLP, but the newest 13 vessels all have pretty traditional financing and there’s not much to discuss. The significant disconnect is related to the 24 older vessels secured by the “Tranche B,” which is so incredibly conservative that demolition values will surpass total debt by April 2019. Based on the current draconian debt paydown structure, CPLP’s core fleet will be entirely debt free by late 2023, but the majority of the fleet has significant life remaining. A normal expectancy for a product tanker and dry bulk carrier is 20-25 years depending on markets, and containerships should easily do 25-30 years of service. This means that even in heavily bearish outcomes, CPLP doesn’t need to replace much of its fleet until 2026. The sole exception is the 2001-built “Amore Mio,” which is likely to be scrapped in the next few years. This vessel is currently valued at $10.4 million and is likely to generate nearly $10 million from demolition, so there’s virtually no risk here. The Tranche B results in distorted reported coverage levels because it forces CPLP to funnel cash to the banks instead of either investing in more growth (dropdowns) or shareholder returns (distributions). Obviously, older vessels need more conservative financing, but to be unable to borrow in excess of demolition levels is more extreme than common sense would dictate. If rates improve in 2019-2020, I expect CPLP will be able to easily secured an enhanced financing deal with both lower amortization and a higher overall balance (i.e., enough to pull fresh cash out). Recall earlier, when I highlighted CPLP’s sort of odd distribution coverage chart. We’re now going to dive into the calculations and illustrate how the company is presenting overly conservative numbers, effectively sandbagging its own results. “Capital Reserve” – What is This? Virtually every other MLP or LP structure utilizes line items called “maintenance capital reserves” and “replacement capital expenditure reserves.” They are often combined into one line. This is how KNOT Offshore Partners (NYSE:KNOP), Hoegh LNG Partners (NYSE:HMLP), GasLog Partners (NYSE:GLOP), Golar LNG Partners (NASDAQ:GMLP) and Dynagas LNG Partners (NYSE:DLNG) all report their results. These levels are based on calculations describing what it costs to maintain and what it costs to replace assets down the road. Maintenance is relatively simple: it comes down primarily to drydocking and special surveys. Replacement is the annual allotment required for CPLP or others to set aside to buy a new product tanker in 25 years, a new containership in 30 years, etc. CPLP does something different: the company reports real-time bank amortization, presenting a sort of “free cash flow” instead of “distributable cash flow.” The difference might appear subtle or meaningless, but it makes a legitimate huge long-term difference. DCF should, in theory, showcase exactly what is a sustainable long-term payout level. Whereas CPLP’s method of FCF only shows what is payable based on that exact quarter of results and debt structure. Current bank amortization shouldn’t be relevant to long-term DCF. Otherwise, a company can simply buy modern assets, sign a goofy financing deal with almost zero upfront debt payments, and then tout a blatantly bloated number as its DCF. Conversely, if bank amortization is draconian, the reported DCF is sandbagged, because it under-reports the true long-term payout potential. Simply put, CPLP reports these coverage metrics differently than virtually every single peer out there. In the long term, I believe this is because the company is hopeful it can refinance down the road and secure enough “friendly” bank facilities that its DCF and coverage ratios will soar; however, in the immediate term, the net result is that CPLP drastically under-reports its DCF compared to peers. “Decrease in Recommended Reserves” – What is This? When CPLP reports an amount here, it is showing the cost of the distribution in excess of quarterly generated cash flow. Therefore, the company was $1.5 million short during Q2-18. 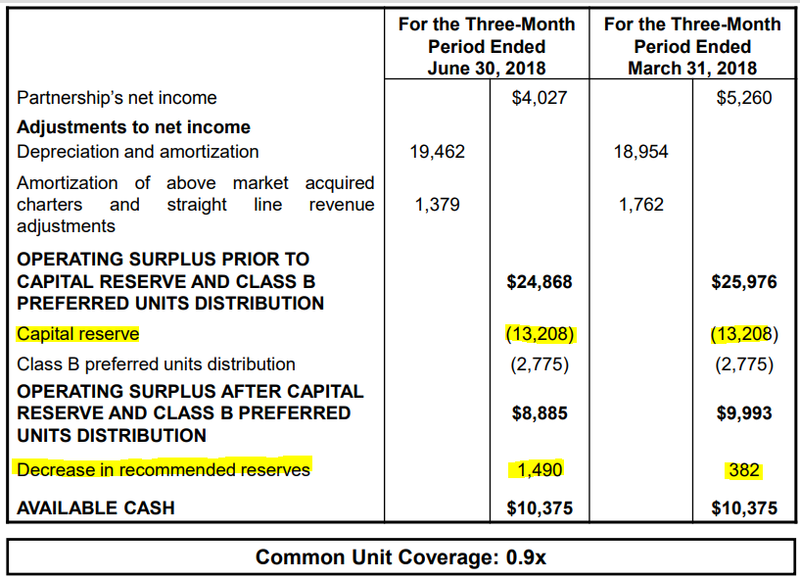 Its immediate FCF supported a 7 cent payout, whereas 1 cent came straight off balance sheet cash. CPLP had $51 million in cash as of 30th June, so a $1.5 million draw is almost insignificant, but it’s still worth keeping an eye on. Bearish folks would point to this as a major weakness of CPLP, but what these folks are ignoring is the massive underlying asset values and conservative debt structures. Without full access to CPLP’s internal calculations, it is difficult to calculate a 100% accurate “correct DCF,” but if we utilize a 20-year replacement curve for crude tankers (4x Suezmax – $55 million, 1x Aframax – $45 million), a 25-year replacement curve for bulkers (1x Capesize – $45 million), 25-year for product tankers (6x MR1 – $30 million, 15x MR2 – $35 million) and a 30-year replacement curve for containers (10x – $50-80 million), then we come up with a replacement valuation of nearly $1.7 billion, or about $1.4 billion net of demolition recoveries. I’ve designed a spreadsheet that calculates each vessel’s annual replacement reserve against the above inputs, and we reach a required replacement reserve of $54 million. However, this is an overly simplistic calculation which does not discount back for retained fund investment. When you keep a replacement reserve, these funds are not simply stuck on a shelf or hidden in a mattress. They are instead continually invested into new assets. MLPs must use a calculation for the expectation of investment returns beyond general inflation – a general benchmark is to use a 5% annual return placeholder. When we utilize this same system for CPLP, we reach an annual requirement of $24.5 million in retained funds. 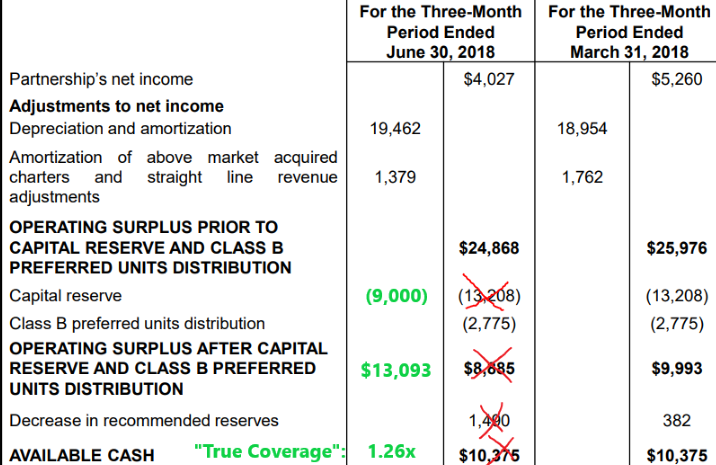 Therefore, the “true” replacement reserve calculation is about $6.1 million per quarter. This is an important calculation as well. CPLP must include a reserve to fund dry docks, special surveys and regulation compliance (i.e., ballast water treatment). These requirements differ by asset type, but I estimate them to range from about $200k/year for the smallest MR1 assets to about $500k/year for the larger tankers and containerships. Using these assumptions, the company must retain close to $12 million per year. Therefore, the “true” maintenance reserve calculation is about $2.9 million per quarter. When these two buckets are combined ($6.1 million replacement reserve + $2.9 million maintenance reserve), we realize CPLP needs to retain about $9 million per quarter, which is significantly less than the $13.2 million currently earmarked for “capital reserve.” Altogether, this means its long-run DCF capacity is at least $0.03/qtr higher than currently suggested. CPLP is inherently safer than most of its peers due to the strong NAV levels and contract fixtures; however, the company isn’t totally immune from a prolonged market downturn. If the current trade war concerns lead to a major global slowdown or recession, CPLP’s fleet values would likely drop by at least another 10-20%. As product tankers contracts roll off into this potential weaker market, DCF would also drop, and in the absolute worst case, $0.08/qtr might not be covered in the short term. To model such an impact, we need to consider what happens to fleet values with a 20% haircut, which would reduce NAV by around $183 million ($914 million down to $731 million). That’s a haircut of about $1.40 per units, which brings CPLP’s NAV down from $4.30 to $2.90. If we add another 25% discount onto the $2.90 NAV to account for market uncertainty and general pessimism, that gets us to about $2.20, which is what I would use as a bear-case terrible market target. We’ve approached CPLP both from long-term yield potential and underlying asset values. Our yield analysis shows that the current annual payout of $0.32 is covered by nearly 1.3x under current market conditions, leading to a current DCF yield of nearly 15%. Obviously if market conditions improve, I expect this number to increase significantly. Our value-based analysis demonstrates that CPLP is worth about $4.30, which is substantially higher than the current pricing. In a full bear scenario, our target price is about $2.20, based off a projected NAV of $2.90. Therefore, we see over 50% upside potential versus about 20% of downside risk. Bottom line: CPLP is cheap, the balance sheets and payouts are conservative, and I believe there’s around 50% upside potential to base-case markets. My target price is $4.30, which is based on current NAV. J Mintzmyer collaborates with James Catlin and Michael Boyd on his Marketplace service. If you found this report helpful, I invite you to follow us for the latest access to our research. We offer a highly-ranked research service, Value Investor’s Edge, which includes deep value coverage on 70+ firms, including dozens of stable high-yield income opportunities. Unlike many others, we’ve never had a dividend cut in any of our income holdings. We’re currently working on our quarterly income review, which covers over 50 opportunities including partnerships, preferred equities, and bonds. Please consider joining the discussion at Value Investor’s Edge. Send a private message at any time for more info. I look forward to sharing new ideas soon! Disclosure: I am/we are long CPLP. Promises always come with the peril of non-performance. It’s a bad plan in life as well as business to promise more than you can deliver. If you expect people to believe your promises tomorrow, it helps a great deal if you kept them yesterday. This probably sounds like old news to most of you since we’ve all been lectured from birth by our parents, teachers and preachers about the necessity and difficulty of always trying to live up to your commitments. But this is how life works. I certainly support the basic concept and agree that it makes all the sense in the world, but the difference today is that technological advances have radically changed the nature of the conversation. The problem now isn’t so much about arrogance or baseless bragging as it is about how and when to deal realistically and effectively with the truth. Because the truth today is a lot stranger in some ways than the fiction of yesterday. Given the powerful technologies we now have at our disposal and the actual and concrete results that new businesses can deliver, there’s a somewhat novel sales problem that I’m seeing. Too many startups are so excited about the powerful possibilities and the real wonders their solutions can work that, in their eagerness and enthusiasm, they’re losing sight of who they’re selling to, and what kinds of solutions those buyers are looking for. Instead of offering simple initial implementations and step-by-step measured solutions –basically addressing and resolving the lowest and most obvious hanging fruit first– what I’m seeing and hearing too often in these kinds of conversations are broad claims and bold statements. “Our software can do anything – just tell us what you need.” Even if that were true, which in some cases is almost certainly the case, it absolutely doesn’t matter to the buyers. And, worse yet, it’s totally off-putting because it shifts the onus of specifying the problems that need to be solved on to the buyers. Here’s the issue: they may know what end results they need (cost economies, productivity enhancements, etc. ), but they likely have no real idea of what your products can do or how your solutions would be introduced and incorporated into their specific operations. So, their natural reaction is to take two steps backwards rather than buying your pitch. And, in your own business and sales approach, you need to be thinking the same way when you present your new products and services. Tone it down – don’t go for the gold from the get-go. Prove your product a little bit at a time. “New” is a nasty word to millions of procurement officers, buyers and other decision makers. “Novel” and “innovative” are right up there as well. Change is always hard to implement, but when it represents new costs, retraining and upskilling commitments, the risks of errors and mistakes, etc., it’s an even harder sale. And it’s no easier when the impact and the benefits aren’t immediately demonstrable. In the real world, no one is looking for a miracle. They want risk-free, middle-of-the-road, mundane improvements that might save their companies some money, but will certainly save their jobs. They want immediate solutions, not ultimate salvation. This is in part because they’re not sure that they’ll even be around for the big, long-awaited payoff. So you need to plan, sell, and act accordingly. Is there really something to the notion that, if we hold a thought in our mind over time, we can eventually, almost magically, bring it to life? This has been called the “Law of Attraction” and people like the author Richard Bach and his book, Illusions, which helped popularize it. There is certainly something to this idea, but it isn’t magic. And it actually predated Richard Bach, going back as far as Think and Grow Rich by Napoleon Hill. The way it really works is that we are constantly making decisions in our lives, day in and day out, about how to spend our time and energy. When something is top of mind for us–when the thought is always right there–you will inevitably make decisions that bring you closer to making that thought a reality. No matter what you might want to achieve–a happy marriage, losing weight, more money in the bank, or running a PR in a marathon–the more you think about that thing, the closer you come to achieving it, because every little decision you make is in the right direction. This approach is incredibly powerful and I’m happy to share a simple trick I learned from my friend Dave Lindsey, Founder of Defenders, to help you harness this power and help achieve your dreams. Go to your desk and open the drawer. Chances are you might have an unused stack of Post-It Notes in there. If not, go out to our local office supply store and buy a pack. Take care of them because they can help make your dreams come true. To do that, make a list of the three to five big goals you want to achieve. While I’ve seen people have lists of goals that stretch to more than 20 items, I encourage you to stick to a manageable number. Now the key is that they are specific and based in time. While the picture above says lose weight, a better goal is lose 20 pounds by the end of the year. Write each of those goals down on Post-It Notes and then, when you get home, stick each of them to your bathroom mirror. So, three goals means three Post-It notes. Now, every day when you wake up and right before you go to bed, you’ll be staring at those three to give goals–which will keep them at the top of your mind and help you make decisions to bring you closer to achieving them. After you wake up, for instance, and brush your teeth, you’ll already be thinking about what you need to do that day to make progress toward your goals. Then, later on at night, you will think about what you did that day–and what you can do tomorrow–to keep making progress. You’ll be absolutely amazed at how effective you’ll become at chasing down your dreams. And I would wager that you will accomplish at least a few of them in less than 12 months. There is nothing like the feeling of accomplishment when you peel off a Post-It note from you mirror because you have achieved a long-term goal. And you don’t have to believe just me: there are thousands of people who will vouch for this technique in helping them achieve their goals and change their lives. All thanks to a few simple Post-It Notes. So what do you have to lose? Grab some Post-It notes and make today the first day in your journey to making your dreams–no matter what they are–come true.